Craig James's sad longshot campaign has entered an even more desperate phase: He's seeing mirages in the desert and mistaking his friends for oversized hot dogs and accepting endorsements that don't actually exist. James's campaign announced today it had received the "support" of San Antonio's Tea Party leader George Rodriguez. Hooray! 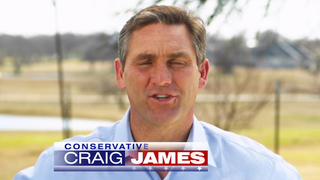 A release on James's campaign website quotes the Tea Partier as saying, "I think Craig James would make a great United States Senator and I am honored to call him my friend." James's campaign lamely told MacLaggan that they had said only that Rodriguez "supports" James, not that he endorses him. Bla bla. "Supports," "endorses." "Potato," "potahto." "Killed five hookers while at SMU, didn't kill five hookers while at SMU."